Thank you so much for the strong support of this Tour Page. We hope you enjoyed the shows you attended and glad you found them via this Blog. We are here to help. We advise you always check details (Day of event if possible) with Venues, Clubs and artists websites for updates to avoid disappointments travelling should there be any cancellations. We speak from experience! SUPPORT US: Please support the countless hours that go into compiling and updating all the live music dates on this page, thank you! WHEN: Fri - Sunday 13th to 15th March 2020. Multi award-winning and successful American pop-rock singer, songwriter and actress, real name Alecia Beth Moore. P!ink released her debut album, "Can't Take Me Home" in 2000, followed by "M!ssundaztood" (2001), "Try This" (2003), "I'm Not Dead" (2006) and "Funhouse" (2008) , "The Truth About Love" (2012 - her biggest selling album to-date) and 2017's: "Beautiful Trauma". 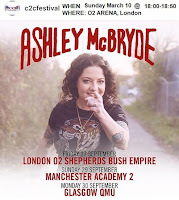 Following the announcement of her album 'Phoenix' there are now 2019 UK tour dates. They announced details of a 2019 Viva 4 Ever reunion tour without founding member Victoria Beckham. 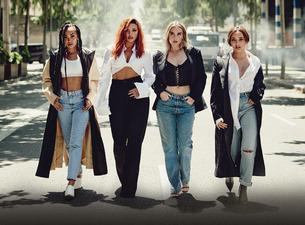 After months of rumours following the group's meeting in February this year, Geri, Emma, Mel C and Mel B have confirmed they will play six stadium shows next year. Tickets go on sale on Saturday, November 10 at 10.30am. 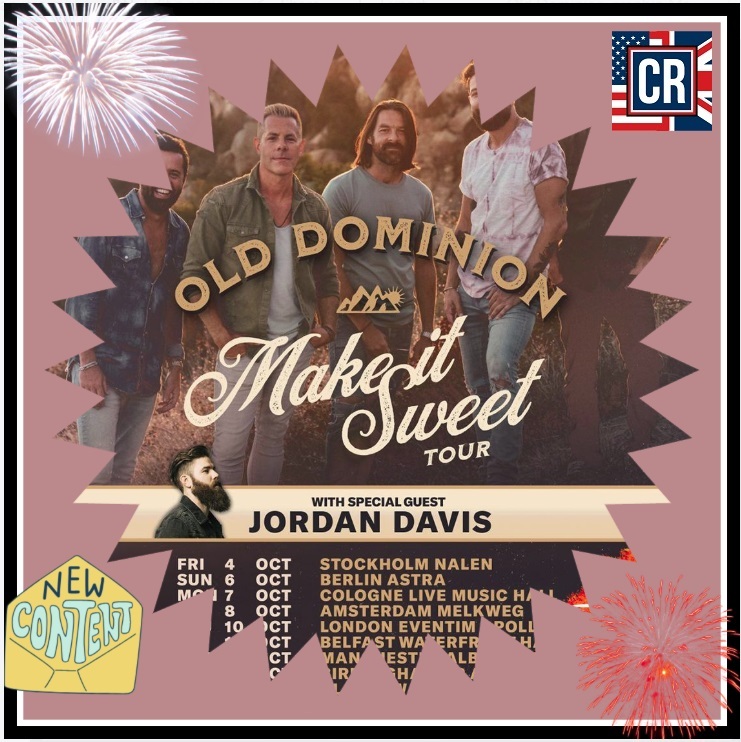 Old Dominion has announced European dates to their Make It Sweet Tour with shows in Germany, Netherlands, Sweden and the U.K. beginning Oct. 4 in Stockholm. Joining them are special guest MCA's Jordan Davis. 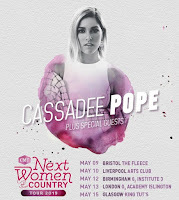 Cassadee Pope has confirmed she will be extending her CMT Next Women of Country tour to include five UK headline shows in May. Georgia native Lauren Alaina has added six more dates to her previously announced appearance at the new Dixie Fields Festival in Essex. She will be making stops at Manchester, Liverpool, Glasgow, Brighton, Nottingham & Bristol. 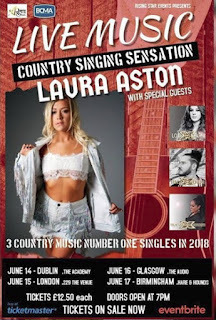 It will mark Alaina’s first time in the UK since performing at C2C: Country to Country in 2016. 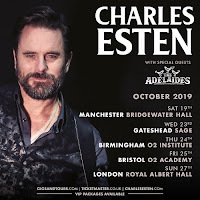 After playing sold out dates in January Charles Esten has announced his biggest headline UK tour to date finishing at London’s prestigious Royal Albert Hall! Hot UK trio The Adelaides to support once again! 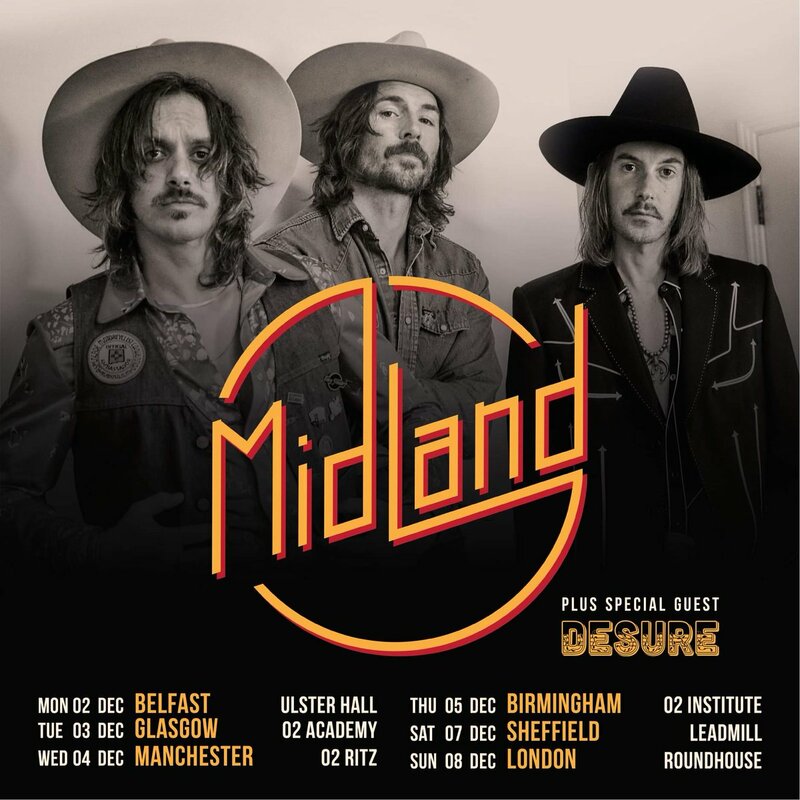 Midland are heading back to the UK in December for a headline tour it has been announced. 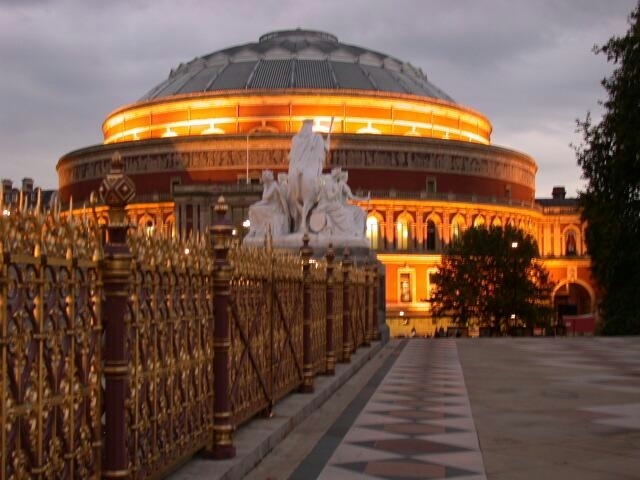 The trio will kick off a 6-date tour at Ulster Hall in Belfast. They will then make stops in Glasgow, Manchester, Birmingham and Sheffield before bringing things to an end at Roundhouse in London. It follows their sold-out December 2018 tour, which saw them perform a headline show at O2 Shepherd’s Bush Empire. 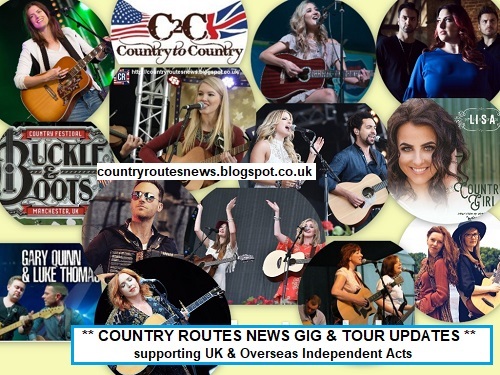 The band have made touring in the UK a priority since performing at C2C: Country to Country 2018 where they appeared on the Main Stage. 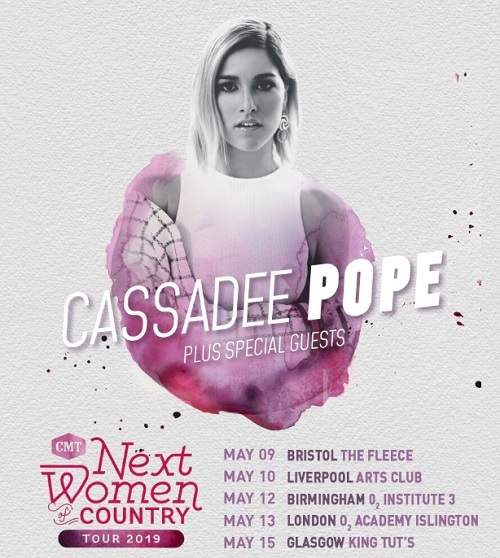 The Country/Pop star will be calling at Birmingham, Cardiff, Glasgow, Manchester & London. The UK tour opens on Fri June 27 at Birmingham Resorts World Arena before calling at Cardiff Motorpoint Arena (June 30), Glasgow SSE Hydro (July 2), Manchester Arena (July 3) and London Wembley SSE Arena (July 4). 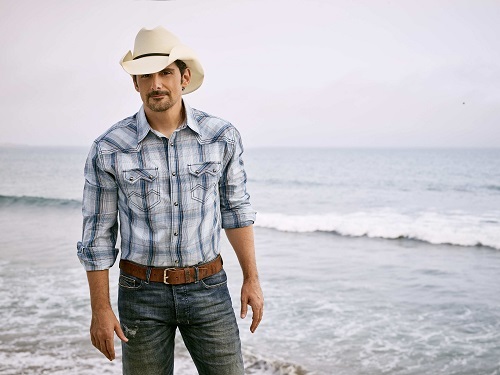 Multi award-winning country superstar Brad Paisley will makes a very welcome return to the UK to play London’s The O2 on Saturday 12th October 2019. Support comes from Chris Lane. 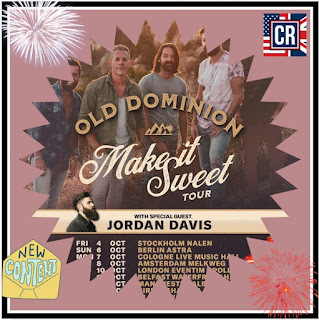 Sat 19 October 2019 - The O2 Arena, London (Millennium Way, Greenwich, London, London, SE10 0DX) support Chris Lane! Maren Morris has announced she will perform five UK shows in May as part of her GIRL world tour. 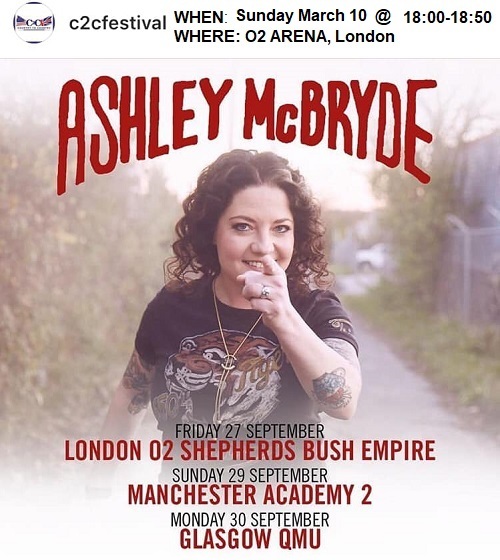 The American country singer's forthcoming album will be supported with the live dates and marks her first UK tour since 2017. Tickets are available from 10am on Fri 25 Jan. The singer put out two albums ahead of her 2016 major-label debut, Hero. The record achieved the top spot of the Billboard Top Country Albums chart as was supported with a world tour. Morris's latest single, 'GIRL', dropped Thursday Jan 17 and is to be the lead single of her forthcoming album of the same name. A release date for the new record is yet to be confirmed. Maren Morris will kick off her UK tour on Sat 25 May at the O2 Academy in Leeds. The singer will move on to Manchester, Bristol and Birmingham before a final show, on Fri 31 May, at the Royal Albert Hall in London. Support comes from Rae Lynn. 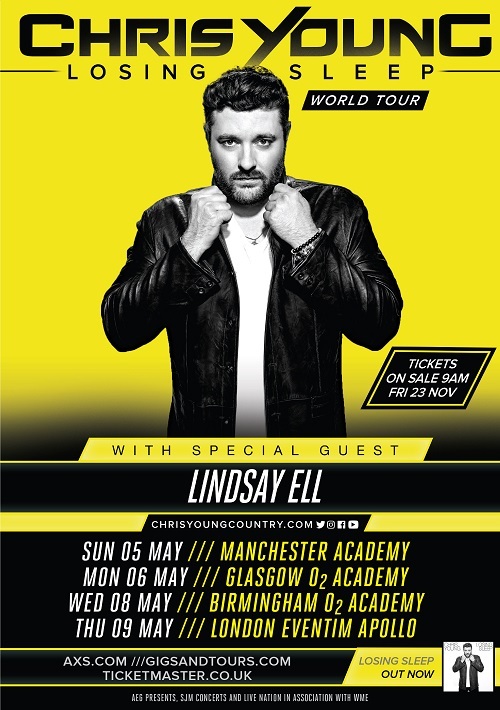 Country singer-songwriter Chris Young is heading over to the UK in May for four UK shows in London, Manchester, Glasgow and Birmingham. His previous album – the acclaimed 'I’m Comin’ Over' – was the most successful album of his career. Debuting at #1 and earning numerous industry accolades, it featured three chart toppers – “I’m Comin’ Over” “Think of You” (featuring Cassadee Pope), and “Sober Saturday Night” (featuring Vince Gill). But with his new album 'Losing Sleep', Young pushes even further down that road. Traditional themes fuse with streetwise urban flair, and it’s all welded together by one of the current genre’s most classic sounding voices. After her July 2018 show at Perth Concert Hall with the string quartet known as the Southern Fried Strings, she wanted to do it all over again. The addition of strings lends a whole new dimension to the songs, and playing them this way is a thrill like no other. The Strings Attached Tour will include Gretchen’s band, including Conor McCreanor and Colm McClean, led by Barry Walsh, along with the Southern Fried String Quartet, this very special tour will feature a full range of songs going all the way back to The Secret of Life and up to the present. Weds 24 April 2019 - Carrington House Hotel, Knyveton Road Bournemouth (Website | 27-31 Knyveton Rd, BH1 3QQ) 8:00pm Cover songs gig Multi genre from 60s plus. 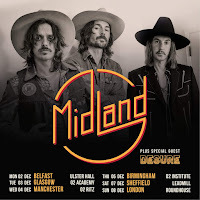 Headline by indie-folk trio, Wildwood Kin and with handpicked regional acts set to join the line-up, the tour will be a huge celebration of country, Americana and roots music. Sun 2 June 2019 - All Points East, Victoria Park London, London (Grove Road, London, E3 5TB) @ 1:00 pm w/ Bon Iver, Mac Demarco, First Aid Kit, John Grant, The Tallest Man On Earth, Julien Baker, Snail Mail, Kokoko! Claimed 'the next big thing', Canaan Cox is, without a doubt, living up to that expectation. With his single, 'Lie' hitting Top 20 Most Added Song on Music Row and his self titled EP reaching Top 50 Most Downloaded album on iTunes, he continues to climb up the industry ladder. 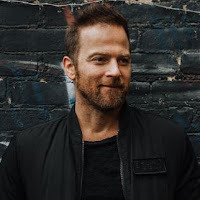 With over 250 shows in 2018, Canaan is no stranger to the headlining and supporting major acts like Justin Moore, Chuck Wicks, and Walker McGuire. 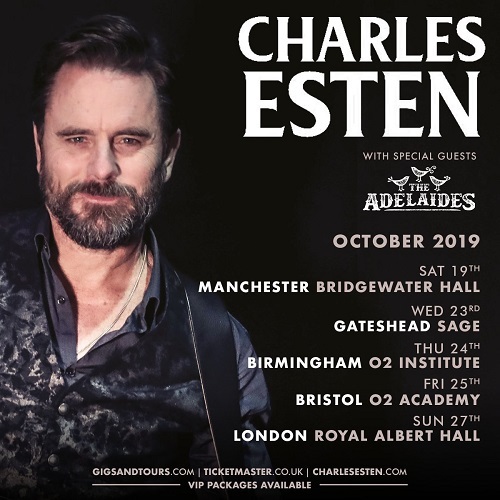 After a successful acoustic England tour in the fall of 2018, Canaan was quick to engage with his UK fans to come back across the pond. Catch him on his 'Long Way Home UK Tour' this June! The extraordinarily talented Laura Aston has produced a breath taking new album ‘”The Covers Collection’. Paying tribute to the songs that helped her rise to a social media sensation over night. Laura became a household name following a cover song going viral on Facebook and receiving millions of views. - Tracyleanne Jefford (X Factor 2017) >> Six Chair Challenge | The X Factor 2017 She previously auditioned for the show in series three, but was eliminated in bootcamp. On the second live show, Jefford performed "Ain’t Your Mama" by Jennifer Lopez, but received the fewest public votes, becoming the fourth act to be eliminated. Two-time Grammy winner John Prine returns to the UK as part of The Tree of Forgiveness World Tour in September 2019. Almost 50 years into his remarkable career, the 2019 Rock & Roll Hall of Fame and Songwriters Hall of Fame nominee has drawn praise from Bob Dylan, Bruce Springsteen and many other illustrious artists. Artist: Brad Paisley support Chris Lane! There will be a Hog Roast meal on the Saturday night which is included in the festival price. A superb indoor venue with dance floor. Ample space for camping/caravans/motorhomes. A fun packed weekend with some surprises in store. Run by Eggborough Events this is set to be an exciting new festival. As well as “incredible live performances”, there will be food, stalls, Photo Booth and Meet and Greet opportunities with the artists! Towerfest 2019 is slated to be "the biggest and best ever" with the Thursday night in two rooms of the clubhouse and Friday, Saturday and Sunday on their open air stage. Great value for money and an "amazing line up" for their 13th festival. Blurb: We’re bringing together a bill of passionate, roots inspired artists, to give you a unique festival with amazing musical talent. Black Deer Festival second lineup announcement revealed that The Staves, Kris Kristofferson, The Mavericks, Marcus King, Jerron ‘Blind Boy’ Paxton and Groundhogs will be performing over the three-day festival joining the likes of Band of Horses, The Dead South and Ryan Bingham. Saturday Evening: L.A. Country plus Ben Thompson. 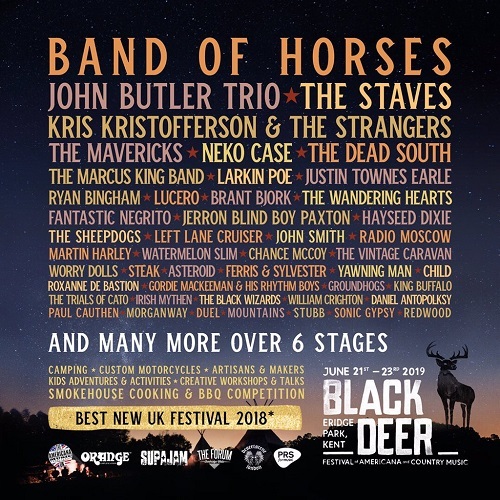 Their vision for Dixie Fields is to combine well-known and popular country artists from US with local UK talent to give festival goers a taste of the fastest growing musical genre there is. Other performers include Sarah Darling (USA) and Robert Vincent, (UK Americana Music Association’s “Album of the Year”) . Additional artists TBA. 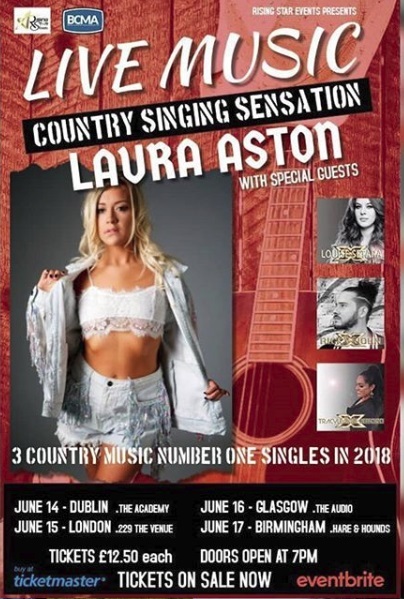 Ward Thomas, Catherine McGrath and Sarah Darling will headline this new annual event at the Winter Gardens indoor entertainment complex in the centre of the UK’s number one seaside resort, Blackpool. Support artists include Laura Oakes, Megan O’Neill, The Adelaides, Worry Dolls, Blair Dunlop, Rob Heron & The Tea Pad Orchestra, Danny McMahon and Jake Morrell. The Apollo Country Music Club meets fortnightly on a Sunday evening. 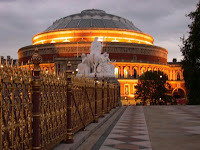 They offer a fantastic selection of solo singers, duo's & bands coming from far & wide. They also have our own in-house country disco to entertain during the break. The Delphi Centre has one of the largest dance halls in the area and boasts one of the best sprung dance floors locally, with many other appealing features such as a bar, good acoustics, great seating area and a high stage which enables dancers and non-dancers alike to see the artists from just about anywhere in the hall. for this knowledge thanks for share . very informative for me and other student . . . Thanks Jemmy for the kind comment. We have now added an extensive list of artists and Festival tour dates for 2015. I hope it helps. Thanks for sharing this blog. I appreciate you for posting this blog.